Joseph PEASLEE (c. 1600 – 1660) was Alex’s 11th Great Grandfather; one of 4,096 in this generation of the Miller line. Joseph Peaslee was born about 1600 in Bristol, England. It is frequently claimed on the internet that his parents were William PEASLEY and Anne CALVERT. This claim has been disproved. The dates do not match up. Also, the New England Peaslees were Protestant and the Virginia Peaslees were Catholic. Given the big gap in his children’s births, he probably had a first wife. He married Mary JOHNSON. The tradition in the family is that he was born and lived in the western part of England, near the river Severn, adjoining Wales. With his wife and two or three children he emigrated, about 1635, and came to Newbury, Massachusetts, in 1642. Joseph died 3 Dec 1660 in Salisbury, Essex, Mass. Mary Johnson was born about 1604 in Wales. By tradition Mary was the daughter of a Welch farmer of comfortable worldly estate. Her parents may have been John JOHNSON and Hannah THROCKMORTEN. Mary was possibly a blood relative (presumably sister) of Edmund Johnson who sailed from Southampton on the James in 1635. There was certainly a close tie between this Edmund Johnson and the Peaslee settlers, for there is a record of Joseph’s daughter Mary going to stay with the widow of Edmund Johnson when he died (<1660). Mary died 27 Sep 1694 in Haverhill, Essex, Mass. Alternatively, Mary was born 1622 in Trevor Issa, Denbighshire, North Wales and Jane and Mary Peaslee were from a different family. The baptism of John Ap John de trevor Issa, and of MARIA, veh John Ap John (sic). Another reads: Anne, veh John Ap John de Trevor, baptizata est secundo die —, 1632. It may be assumed that these entries are related to our friend and to his two sisters; the abbreviated term veh implying verch, or daughter, the name of the father being the same as that of the son. It appears probable that John Ap John was born between 1625 and 1630 at Trevor Issa. … The absense of information which surrounds the particulars of his birth, also extends to the marriage of John Ap John. From the foregoing, it would seem that the “Maria” mentioned in the parish records is the Mary Johnson who married Jospeh Peaslee. All in all, not a lot of “proof” but some seemingly reasonable assumptions that the Johnson family that intermingled with the Joseph Peaslee family was probably related to the original Edmund Johnson. 10 Dec 1646 Haverhill, Mass 12 Jan 1684 Dover, Norfolk, Mass. 3. Elizabeth Peaslee 1632 in England John Collins? 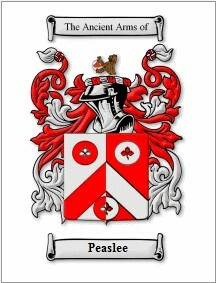 The name Peaslee is claimed by some to have sprung from Peter, from which we have Peers, Pearse and Pears. Others assume it was an offshoot from peas, a legum. Peas were grown in the east from time immemorial and were introduced into Europe in the Middle Ages. Shakespeare spoke of peasblossom. Lee is from lea, a pasture. The man who was the son of Mr. Peas perhaps lived on the lea, and to distinguish him from the other Mr. Peas he was called Peas-at-lea, and finally Peaslee. Joseph was a lay preacher and minister. Later this gift of preaching made trouble in the new settlement and history for Joseph. Soon after he removed to “Newtown,” the inhabitants neglected to attend the meetings for worship in the old town and did not contribute to the support of the minister. They held meetings for worship at private houses, and in the absence of a minister, Joseph Peaslee and Thomas Macy officiated. The general court, which had jurisdiction over territory from Salem, Massachusetts, to Portsmouth, New Hampshire (was called Norfolk county), soon fined the inhabitants of “Newtown” five shillings each for every neglect of attending meetings in the old town and an additional fine of five shillings each to Joseph and Macy if they exhorted the people in the absence of a minister. This decree was not heeded. Meetings were held and Joseph and his friend continued to preach. The general court made additional decrees and fines, which also were not heeded. Macy fled from persecution in Massachusetts and settled in Nantucket, Rhode Island in 1659. George MARTIN was one of the fifteen “humble immortals” who, in 1653, stoutly and successfully maintained for the first time the right of petition for the subjects of the English crown. Lt. Robert Pike (son-in-law of Joseph MOYCE), of Salisbury, an influential citizen, had denounced a law passed by the General Court, for which he was convicted, fined and disfranchised by the General Court. Lt. Pike, a prominent town official and later a member of the General Court, denounced the law forbidding to preach if not Ordained. Which law was aimed at Joseph PEASLEE and Thomas Macy, believers in the Baptist Doctrine, with Quaker tendencies. The autocratic General Court resented this and Lieutenant Pike was fined over thirteen pounds and bound to good behavior. This punishment caused many citizens of Salisbury and the surrounding towns to petition for a revocation of the sentence. This offended the Court still more, and the signers were called upon to give “a reason for their unjust request”. Out of the seventy-five who signed, the above mentioned fifteen alone refused to recede or apologize, and they were required to give bonds and to “answer for their offense before the County Court”. Their cases were never called to trial, and they thus, by their firm stand, laid the foundation for these rights, which are now granted in all the civilized world. Ironically, after George died, his wife Susanna was executed for witchcraft on 19 Jul 1692 in Salem, Essex, Mass. Joseph Peaslee was a Puritan, a reformed Episcopalian. The creed was to abandon everything that could boast of no other authority than tradition, or the will of man, and to follow as far as possible the “pure word of God.” The Puritans came to the wilderness of America to escape persecution in England and to enjoy their own religious liberty, but not to allow religious freedom to any who’ differed from them. Nowhere did the spirit of Puritanism, in its evil as well as its good, more thoroughly express itself than in Massachusetts. The persecution of Joseph was of short duration, as he died at Salisbury “Newtown,” December 3, 1660. He made his will November 11, 1660, proved February 9, 1661; Mary Peaslee, executrix. 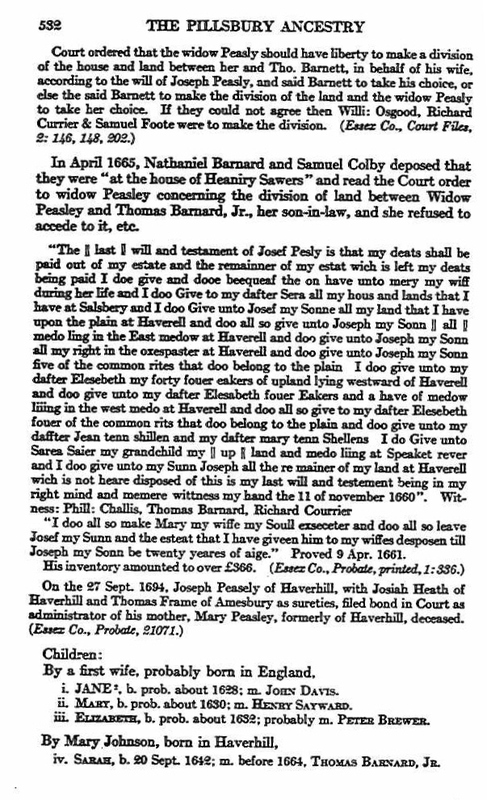 In 1662 the widow, Mary Peaslee, was granted one hundred and eight acres of land in Salisbury. The administration of her estate was granted September 27, 1694, to her son Joseph. Joseph’s son Joseph Jr. received “children’s land” in 1660 and a “Township” in 1660, being a tract of land, conferring the right to vote and take part in town meetings when of age. He resided in Salisbury “Newtown” until after his marriage and birth of his eldest child, Mary, when he removed to Haverhill, Massachusetts. He was a physician and farmer; owned saw and grist mills, a large landholder by grants, inheritance and purchases, and had large tracts of land beyond the Spicket river, now Salem, New Hampshire, inherited from his father. He took the oath of allegiance and fidelity at Haverhill in 1677; built a brick garrison house with bricks imported from England about 1673. This house is in East Haverhill on the highway now called the “River Road,” and is still [in 1909] standing in good repair, one of the landmarks of the Merrimac valley. Joseph held many town offices, was much in public life, and a member of the Society of Friends. For many years there was an established meeting of that denomination at his house. He died at Haverhill, Massachusetts, March 21, 1735, and his widow was living in 1741. 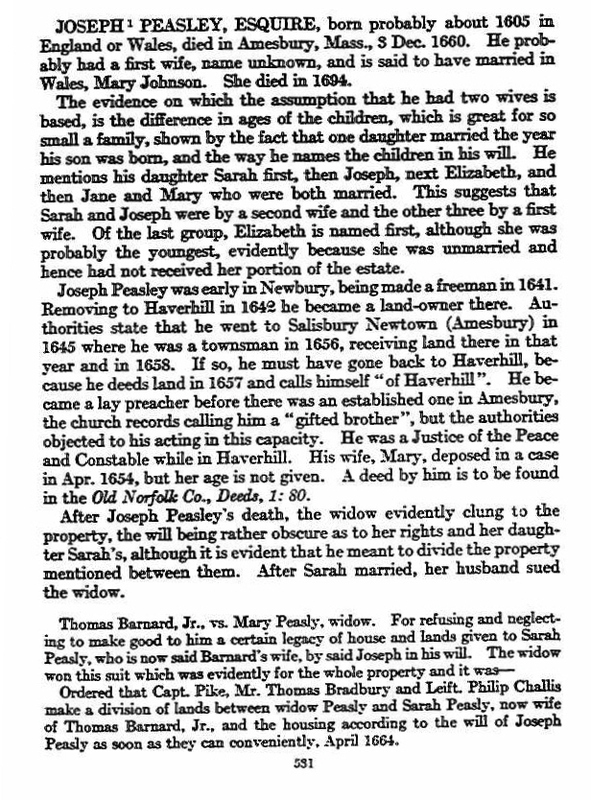 From the records he evidently distributed his estate by deeds to his heirs, with this closing clause, “Saving always and hereby reserving unto myself the free use and Improvement of ye premises During my natural life.” Children by first wife: Mary, married an ancestor of John Greenleaf Whittier; Joseph, Robert, John, Nathaniel. Ruth, Ebenezer and Sarah. Whareas we James Senr Davice and Theophiles Sachell war asked by the widdow peasly and ? ? 17th century religious pioneer, originally from Cefn Mawr, who was jailed several times for his beliefs. The very first Quaker Meeting in Wales was held at his home in Cefn Mawr, an area which was then known as Cristionydd Kenrick, a township within the Parish of Ruabon. John ap John was educated at Wrexham where he possibly came under the influence of Walter Craddock, a leading Puritan preacher. During the Civil War it is thought that John ap John served as a Chaplain with the Parliamentarian Army at Beaumaris, Anglesey. After the war, he joined Morgan Llwyd’s Church at Wrexham, where he soon became a leading member and travelling preacher. It was through Morgan Llwyd that he met George Fox, the founder Of the Society of Friends. In 1653, John ap John stayed at Fox’s headquarters in Swarthmore, Lancashire where he learned about the philosophy of ‘The Inner Light’ and the teachings of George Fox. When John ap John was convinced of the truth he became the very first Welsh Quaker. To say simply that he spent the greater part of his life tramping through Wales preaching the Quaker message would be to ignore the bravery of this man. For these were the days of religious intolerance, when heretics were condemned to death and the Law Courts threatened to burn Quakers. He spent a life-time being persecuted and was incarcerated because of his beliefs in the jails of Cardiff, Usk, Tenby, Swansea, Welshpool and possibly Carmarthen. He was gaoled for such offences as refusing to remove his hat in the presence of a social superior and fined for holding religious services inside his own home. In 1681, John ap John met William Penn in London and was instrumental in persuading Penn to allocate 30,000 acres of his American land to Welsh Quakers. John ap John died in 1697 at the home of son in law, John Mellor of Ipstones, Staffordshire, and was buried in nearby Basford. He lies in an unmarked grave in what today simply looks like a field. Dear Howard, Thanks for your response. There is a 1919 article from _Cymru_ by Rev. Thomas Shankland, written in Welsh, that bears review. I am, alas, very limited to my command of that ancient and formidable language, but Rev. Shankland seems to (a) criticize some of Mr. Palmer’s conclusions, and (b) suggest 3 separate places in which John ap John lived: namely, Trevor; Rhyddallt; and the house in Cefn Mawr on the Newbridge Road that’s next to the old (but not quite so old) baptist chapel – when I visited a few years ago, this last building was being used as a stable. I have the article and am happy to share it with you; I’m not hard to track down, there aren’t very many “ss” Larssons practicing law in Philadelphia. My particular interest is that I’m trying to find out from whence John ap John sprang. There are 19th century sources in the USA (see, e.g., History of Ware, NH) that speculate that John ap John was originally from Monmouthshire, and that his father (unsurprisingly named “John”) was the sole surviving son of an Edmund/Edmond (and his other sons) who drowned “in the river at Ponty Pool” in 1600. [As an aside, I imagine that, if such an accident actually occurred, it could have been in January 1606-07, when the Severn’s springtime tidal bore, combined with what some people think was a major storm and other think might have been a tsunami, touched off a flood that killed thousands of people and destroyed paper records throughout Gloucestershire, Somersetshire, Devonshire, Monmouthshire, Glamorganshire, and the Gower Peninsula]. As the story goes, this surviving “John” had two (and, in other versions of the story, three) children: John, who stayed in Wales and adopted the Welsh patronymic; Edmund/Edmond, who emigrated to America (from London) in 1635 on the ship “James” and became a founding settler of Hampton, New Hampshire (and, in other versions of this story, a daughter, Mary, who wedded Joseph Peaslee of Gloucestershire, and became founding settlers of Newbury and Amesbury, Massachusetts, and, ultimately, Newton, New Hampshire). Dear David. I thank you for your response to my article and would wish to say that I am mindful that there is a strong indication that John ap John and his wife Kathryn may have lived at the property you describe and which A N Palmer called ‘Plas Ifa’ or ‘Plas Evan’. However, there is other evidence which suggests that after their marriage in 1663 and until the marriage of Richard Davies to Ann Barnes, of Warrington, in 1681 that John ap John and his wife, Kathryn Edwards, and her son, Richard Davies, probably lived together at a property known as Tyddyn y Rhyddallt (also called Rhyddallt Issa). 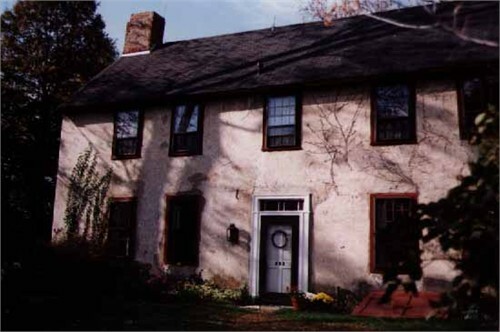 I have seen the deed from William Penn to John ap John and Thomas Wynne that granted to them thousands of acres in what is now suburban Philadelphia (e.g., Merion, Haverford, Bryn Mawr, Bala Cynwyd, Tredyffrin Township). I visited Cefn Mawr a few years ago, and saw the stable building — that A. Palmer believed to be John ap John’s home — still standing, along with the house of his wife, Catherine, on the hillside near the Trevor Sun Tavern. Thanks for this entry. Mary’s first husband Henry Sayward was born 1627 in Farnham, Essex, England. His parents were John Sayward and Anne [__?__]. Henry died 1679 in York, York, Maine. Mary’s second husband Joseph Whittier was born 1637 in Newbury, Essex, Massachusetts. Estimates of Elizabeth’s birth are wide ranging from 1627 to 1648. Elizabeth’s husband John Collins was a Quaker. Elizabeth’s husband Nathan Gould was born about 1614 in England and died between 12 Dec 1692 and 27 Sep 1693 in Amesbury, Essex Co., Mass. 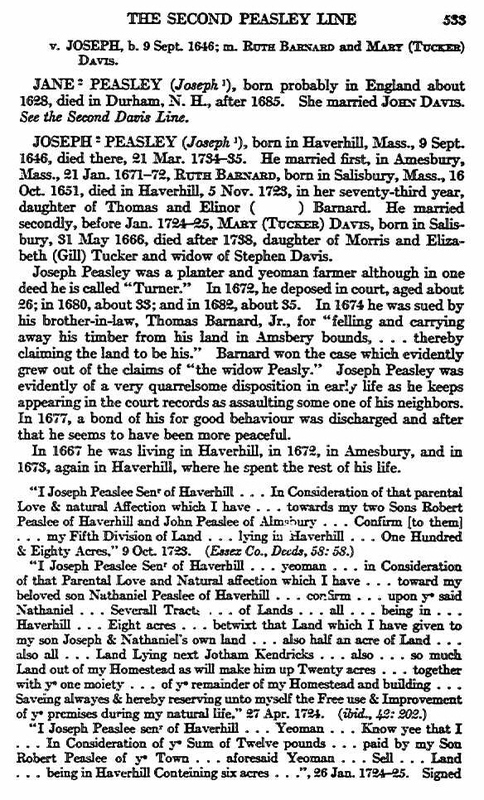 Sarah’s husband Thomas Barnard was born 10 May 1641 in Salisbury, Essex, Mass. His parents were Thomas Barnard and Helen Eleanor Morse. Thomas died 5 Dec 1715 in Amesbury, Essex, Mass. After Joseph Peasley’s death, his widow evidently continued to cling to the property, the will being rather obscure as to her rights vs. her daughter Sarah’s, although it is evident that he meant to divide the property between them. After Sarah married, her husband sued the widow. Joseph’s first wife Ruth Barnard was born 16 Oct 1651 in Salisbury, Mass. 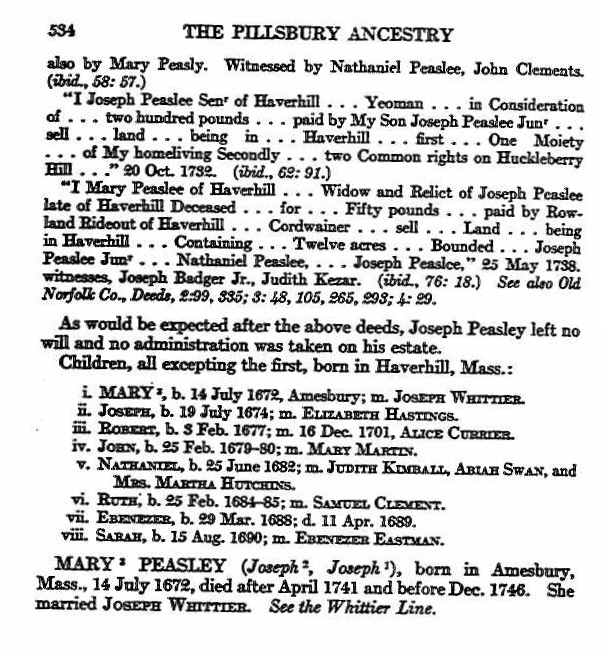 Joseph’s second wife Mary Tucker was born 31 May 1666 in Salisbury, Essex, Mass. Her parents were Morris Tucker and Elizabeth Gill. She first married 23 Dec 1685 in Haverhill, Essex, Mass to Stephen Davis (b. 15 Jul 1663 in Haverhill, Mass – d. 5 May 1719 in Haverhill) Mary died 1724 in Haverhill, Essex, Massachusetts, . Joseph’s daughter Mary married Joseph Whittier on 24 Jul 1694 Haverhill. The poet John Greenleaf Whittier was her great grandson. John Greenleaf Whittier (December 17, 1807 – September 7, 1892) was an influential American Quaker poet and ardent advocate of the abolition of slavery in the United States. He is usually listed as one of the Fireside Poets. Whittier was strongly influenced by the Scottish poet, Robert Burns. Highly regarded in his lifetime and for a period thereafter, he is now remembered for his poem Snow-Bound, and the words of the hymn Dear Lord and Father of Mankind, from his poem The Brewing of Soma, sung to music by Hubert Parry. During the 1830s, Whittier became interested in politics, but after losing a Congressional election in 1832, he suffered a nervous breakdown and returned home at age twenty-five. The year 1833 was a turning point for Whittier; he resurrected his correspondence with Garrison, and the passionate abolitionist began to encourage the young Quaker to join his cause. 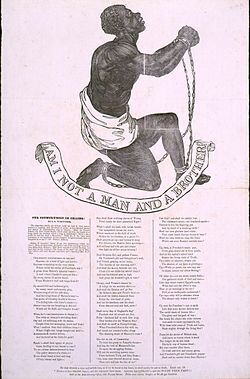 In 1833, Whittier published the antislavery pamphlet Justice and Expediency, and from there dedicated the next twenty years of his life to the abolitionist cause. The controversial pamphlet destroyed all of his political hopes—as his demand for immediate emancipation alienated both northern businessmen and southern slaveholders—but it also sealed his commitment to a cause that he deemed morally correct and socially necessary. He was a founding member of the American Anti-Slavery Society and signed the Anti-Slavery Declaration of 1833, which he often considered the most significant action of his life. Whittier’s political skill made him useful as a lobbyist, and his willingness to badger anti-slavery congressional leaders into joining the abolitionist cause was invaluable. From 1835 to 1838, he traveled widely in the North, attending conventions, securing votes, speaking to the public, and lobbying politicians. As he did so, Whittier received his fair share of violent responses, being several times mobbed, stoned, and run out of town. From 1838 to 1840, he was editor of The Pennsylvania Freeman in Philadelphia, one of the leading antislavery papers in the North. In May 1838, the publication moved its offices to the newly-opened Pennsylvania Hall on North Sixth Street, which was shortly after burned by a pro-slavery mob. Whittier also continued to write poetry and nearly all of his poems in this period dealt with the problem of slavery. This entry was posted in 13th Generation, Dissenter, Immigrant - England, Immigrant - Scot-Irish, Line - Miller and tagged John Ap John - 1st Welsh Quaker, John Greenleaf Whittier, Persecuted Quakers. Bookmark the permalink. I enjoy your site very much. Nice Work!! Thank You!! We have several ancestors in-common. I would like to call your attention to the following notations re: Joseph Peaslee parents. Joseph’s parents were not William Peaslee and Anne Calvert. This frequent Internet claim has been disproved. The Children, dates for these people do not match up. Also, the NE Peaslees were Protestant. The VA Peaslees were Catholic. Joseph Peaslee was born about 1600 in Bristol, England. His parents were William PEASLEY and Anne CALVERT. Given the big gap in his children’s births, he probably had a first wife. He married Mary JOHNSON. The tradition in the family is that he was born and lived in the western part of England, near the river Severn, adjoining Wales. With his wife and two or three children he emigrated, about 1635, and came to Newbury, Massachusetts, in 1642. Joseph died 3 Dec 1660 in Salisbury, Essex, Mass.